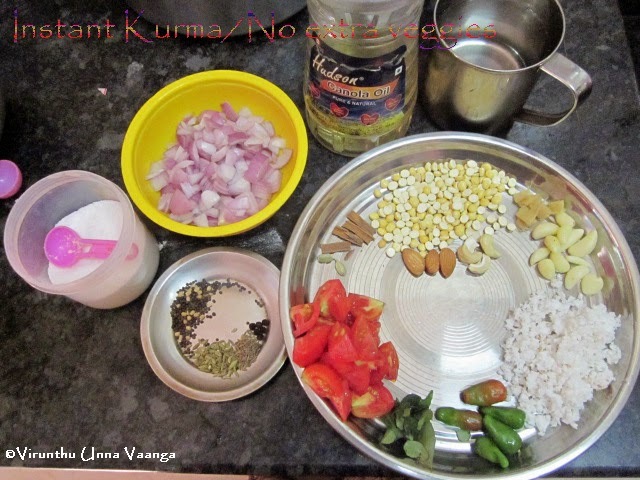 Hi friends, today’s post for VeganThursday event which is initiated by Priya Suresh akka from Priya’s VersatileRecipes. 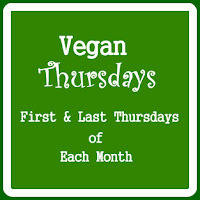 We members post vegan recipes every first and last Thursday of each month. 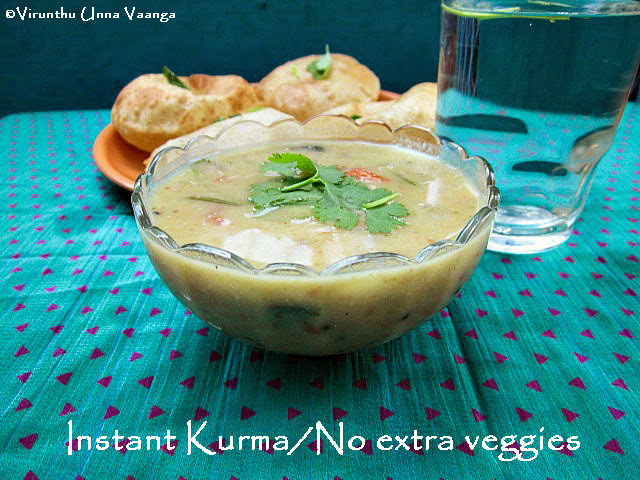 We used to prepare instant kurma when any other vegetables not available or no time to prepare. 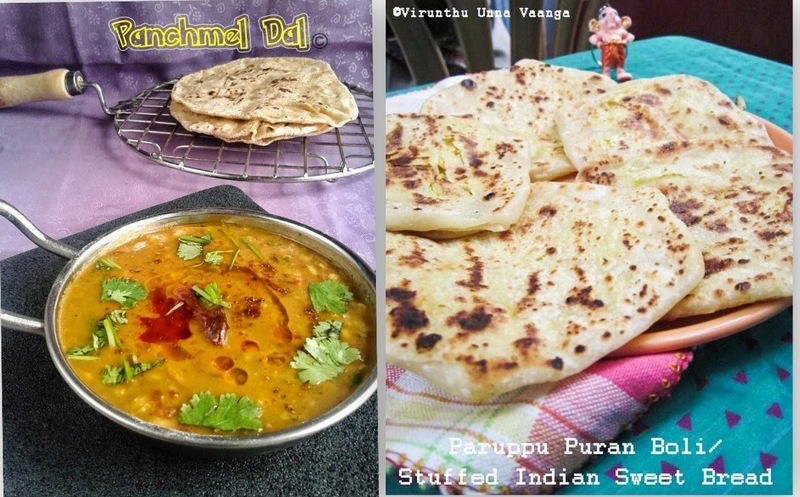 We can prepare the kurma in a jiffy and its wonderful combo for poori and chapathi… I made it for poori and its so delicious and wonder match for poori. The cashew nuts and almonds will give the rich taste and add nutritious to it. Grind the ingredients given in the grind column with little water and keep it aside. Heat oil in a pan adds cinnamon, cloves, cardamom then add fennel, mustard and urad dal wait it for splutter. Add onions sauté it till it turns translucent. Then add chopped tomatoes and sauté it till turns mushy. 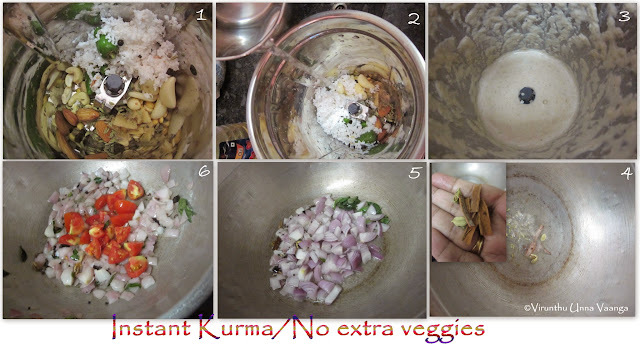 Now pour the ground masala paste to it and add extra water to the kurma add salt to taste. When the kurma starts boiling keep the flame low and cook it till the oil oozes out from the mixture switch off the flame. 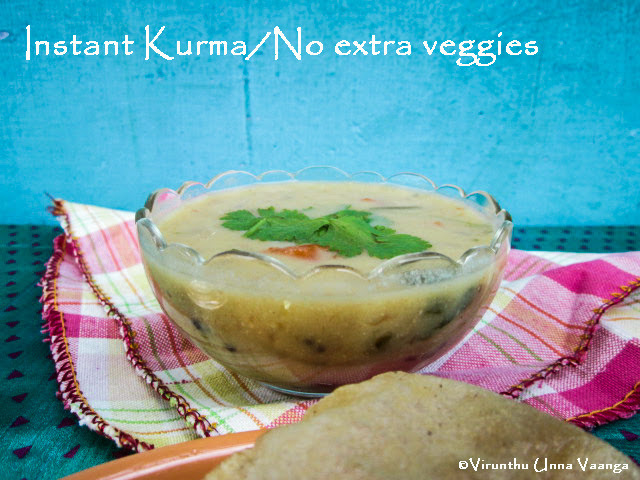 Spread coriander leaves to the kurma and serve with hot pooris/Chapathi/Parotta. If you love peanut flavour can add 2 Tsp of peanuts while grinding. Add mint leaves with onion to get extra aroma and taste. 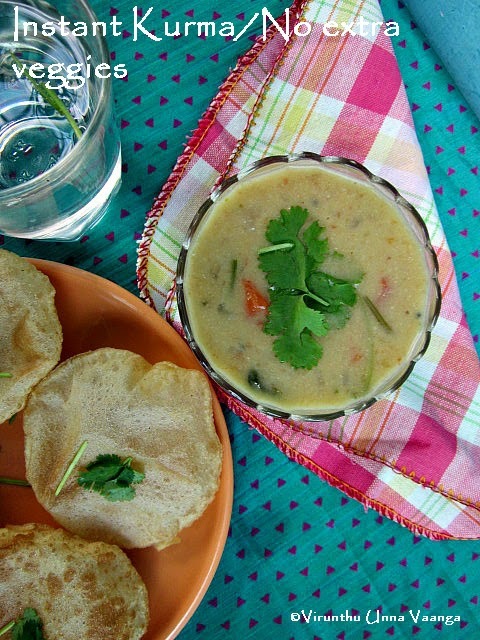 Very succulent kurma with poori!!! 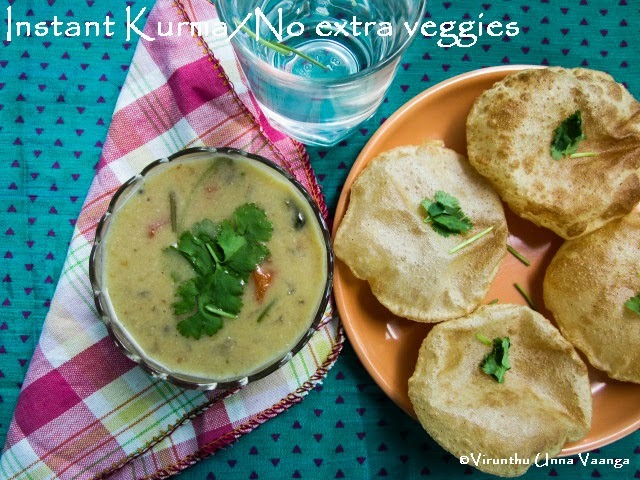 Omg, we do make this kurma Viji, love love love it..Poori kuda semaiya irrukume. delicious kurma and a quick one too. very helpful and very delicious gravy!!! perfect to use as a side!! We too make this kurma viji. love it. Aah.. 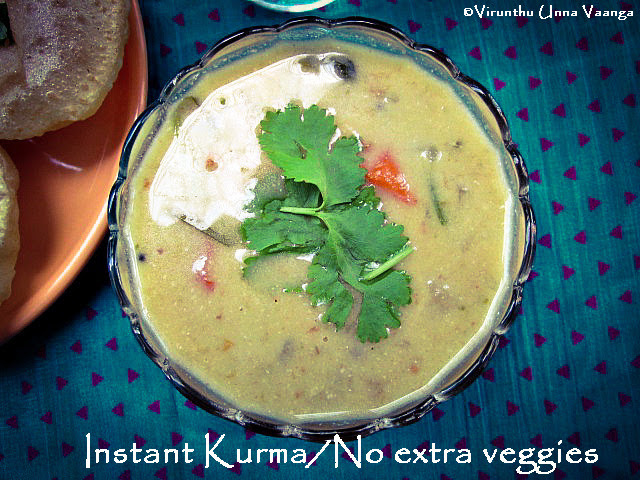 This is perfect kurma dear.. that too with minimum veggies.. M loving it! 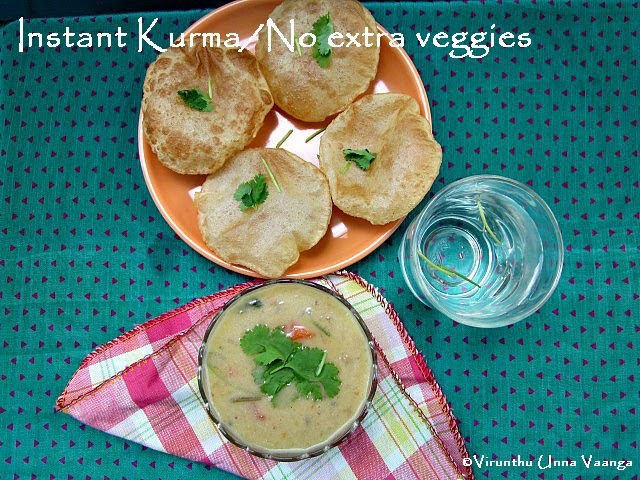 i like kurma with parotta :) yummy..
Oh wow this looks so tempting......saving it for my "no veggies at home" days ...nutritious & tasty! wow!it looks delicious and easy! 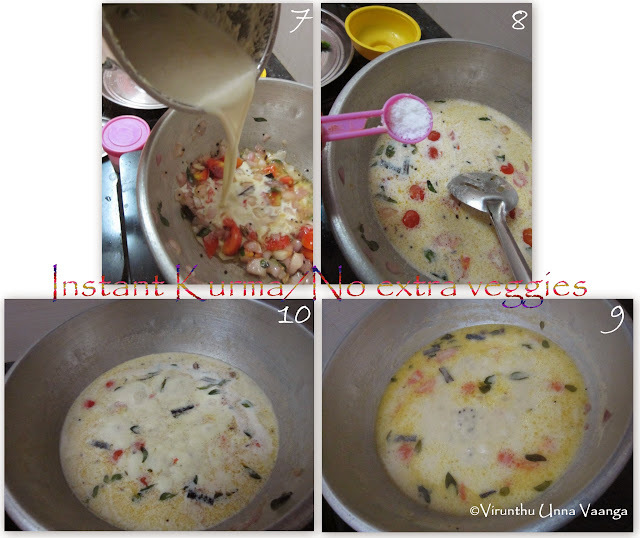 Hi, your Instant Kurma/No extra Veggies was very popular on FoodieNewZ and today it’s featured on our Facebook page: https://www.facebook.com/Foodienewz We have pinned at Pinterest as well http://pinterest.com/pin/71705819040251868/ think of repin at your boards. Hi Vijayalakshmi! I have an award waiting for you, do check out my blog! 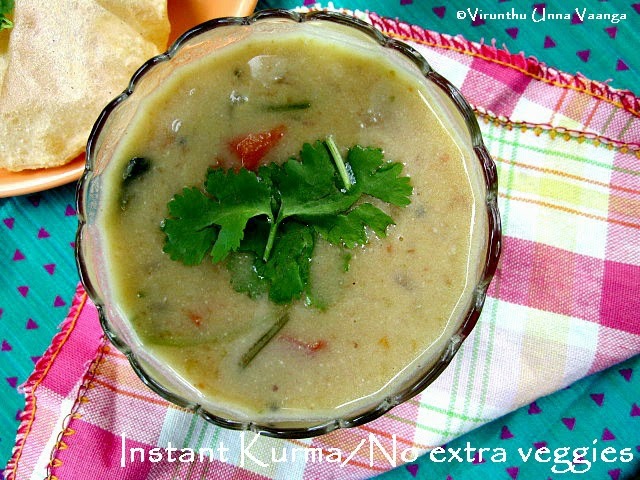 Delicious kurma Viji. 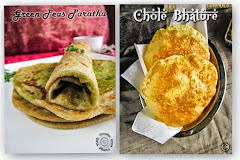 Very nice to go with any chapathi or poori.